Our sensory system provides critical information to our central nervous system so we can respond, adapt and survive in an ever-changing environment. In some instances we are aware of these sensors such as sight, sound, touch and pain and in others we are unaware of them as they work in the background helping us regulate important body functions such as blood pressure. Many of the body's special sensors are found in the head and neck. So when the head or neck are injured following a whiplash event, for example, we often experience pain and a range of symptoms which can be very disabling. All too often the pain and associated disabilities can become ongoing or chronic and very debilitating. Understand why some people but not others develop ongoing head or neck pain and disability even after the initial injury has apparently healed. Prior to becoming a scientist I was in clinical practice as an allied health care practitioner (chiropractor). While in practice I became frustrated that I was unable to identify and predict who I could help and who I couldn't. After turning to the available medical and scientific literature it became clear there was much we didn't know or understand about how our body works and responds to injury of the musculoskeletal system. This prompted me to seek training as a scientist and commence my research. Having previously experienced significant pain and disabilities following an accident involving my head and neck - and realising how little we knew about the mechanisms that caused my headaches, neck pain and dizziness - this became the focus of my research. The aim of my research is to enhance our understanding of how the sensory system affects the central nervous system and what impact this has on our health. My goal is to contribute to a better understand of how our body works so we can more accurately diagnose health problems and develop better treatments and management for people suffering pain and disability. Professor Bolton was awarded a PhD for his research on the central (brain and spinal cord) connections of sensory nerves from the neck which he undertook under the supervision of Professor David Tracey in the Faculty of Medicine at the University of NSW. He then took up a postdoctoral position in systems neurophysiology with Professor Victor Wilson at the Rockefeller University in New York where he investigated how the sensory signals from the vestibular (balance) system interact with sensory signals from the neck. 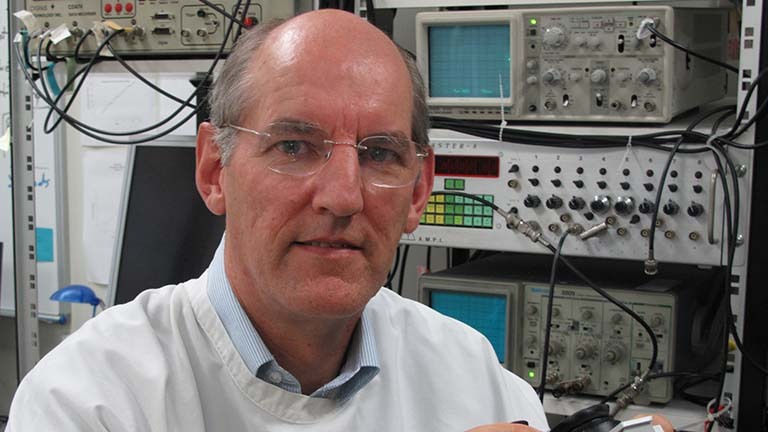 Professor Bolton joined Professor Bruce Walmsley at the University of Newcastle for a second postdoctoral appointment to study how sensory information is processed in the spinal cord. He then took up a research active academic appointment at the University of Newcastle. Since his academic appointment at the University of Newcastle in 1993, Professor Bolton has also held visiting appointments in the Department of Otolaryngology at the University of Pittsburgh, The Prince of Wales Medical Research Institute (now NeuRA), The Bosch Institute at the University of Sydney and the School of Medicine at the Western Sydney University. He has been a research affiliate of HMRI since its founding in 1998. Professor Bolton has received research grants from a number of external peer review granting bodies including the Australian National Health and Medical Research Council.